Mars was a distant shore, and the men spread upon it in waves... Each wave different, and each wave stronger. This classic wasn't what I expected, being more a set of interlocking short stories rather than a true narrative novel, but it nonetheless raises some very thoughtful questions about the nature of space exploration, the arrogance required to colonize another planet (with the obvious parallels to colonial forays on Earth), and whether humans are incapable of peaceable existence anywhere. For all the high-flying philosophical ideas contained within it, the book is extremely readable and only requires the reader to think as many deep thoughts as he or she can comfortably handle. 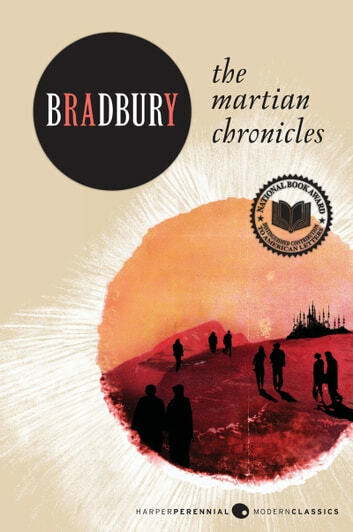 In the introduction to the edition I read, Bradbury expresses bemusement that The Martian Chronicles has come to be classified as science fiction, since there are no technical whizzbang gizmos and his imagining of what Mars is quite at odds with the scientific reality (for instance, his Martian atmosphere is oxygen-based, though similar to a high-altitude setting on Earth). So if you are somewhat sci-fi phobic, fear not. Nothing here will make you feel stupid or regret not paying attention in high-school physics class. Great to think this was written back in 1948. It was an interesting read. I could have read another hundred pages and gone farther into the future through Ray's eyes.